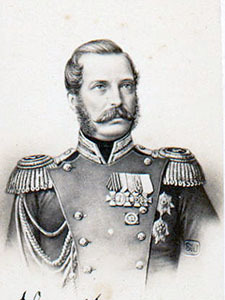 Tsar Alexander II of Russia (1818-1881, reigned 1855-1881). Along with Peter the Great, Alexander II was by far the most important reform-minded tsar of the Romanov dynasty. His reforms of the 1860s profoundly affected Russian society and charted a new course for his country. Read the textbook chapter 29. Read some short remarks by Petr Kropotkin about growing up with serfdom. Check the remarks by Professor Blois and Professor Evans on the Great Reforms. Read Professor Hammond's notes on the "Campaign to Assassinate the Tsar" (*.pdf file). The Russian revolutionaries tried for quite some time to assassinate Alexander II before finally succeeding in 1881. The story of the "hunt for the tsar" is actually very fascinating, and here, in Professor Hammond's lecture notes, you can get a brief account of what was involved. Read chapter 23 and chapter 24 from Mary Platt Parmele (1843-1911) A Short History of Russia (1907, 4th edition). These are short chapters, and this is optional reading. For 50 points maximum extra credit, read Ivan Goncharov (1812-91), Oblomov (1858) and write a one-page paper about why it took Oblomov so long to get out of bed in the morning. For 50 points maximum extra credit, read W. Bruce Lincoln, The Great Reforms: Autocracy, Bureaucracy and the Politics of Change in Imperial Russia (1990) and write a one-page paper about why the tsar actually undertook the Great Reforms. For 50 points maximum extra credit, read Mikhail Saltykov-Shchedrin (1826-89), History of a Town (1869-70) and write a one-page paper in which you explain why the book was so funny yet so realistic. For 25 points maximum extra credit, read the Emancipation Manifesto (also in Russian at schoolart.narod.ru/1861.html) and write a paragraph that answers the question, What was the underlying political rationale for the Emancipation? For 10 points maximum extra credit, submit the answers to the Turgenev study questions.